The seaside pier is perhaps the most iconic symbol of the British holiday resort and for many of us it is the epitome of excursions to the seaside. No two piers are the same, ranging as they do from the clear uncluttered deck to elaborately structured pavilions, from amusement arcades to the landing stages and theatres that were the highlight of pier life in the early part of the last century. Founded in 1979 under Sir John Betjeman, the National Piers Society serves to celebrate the pier, raise it in our consciousness and educate us on preservation, conservation and the economic benefits for seaside towns of a functioning pier. Published to mark the bicentenary of the opening of the first public pier in 1814, at Ryde on the Isle of Wight, this book with contributions from experts within English Heritage and the NPS tells the fascinating story of the Victorian origins of piers, discusses the engineering and architectural challenges imposed by varying climatic and tidal conditions, and the instrumental role of the railways in stimulating pier construction. The core of the book is a complete gazetteer of all piers which the public can visit around the coast of Britain with details of their location, history and current operations, and a variety of historical and contemporary illustrations. 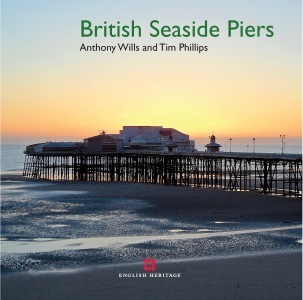 Whether your summer invariably includes visits to the coast or you enjoy the vicarious pleasure of the seaside from a winter armchair, this book is an essential companion for all who admire and value Britain’s rich seaside heritage. The book is an embracing survey and as enjoyable as a walk on a good pier on a find day. ... celebrates our coastal heritage with a wealth of information and stunning photographs from the past to the present day.